Trent Alexander-Arnold has gone from playing in a community summer camp with his school to being called up to the England Senior squad for the 2018 World Cup. 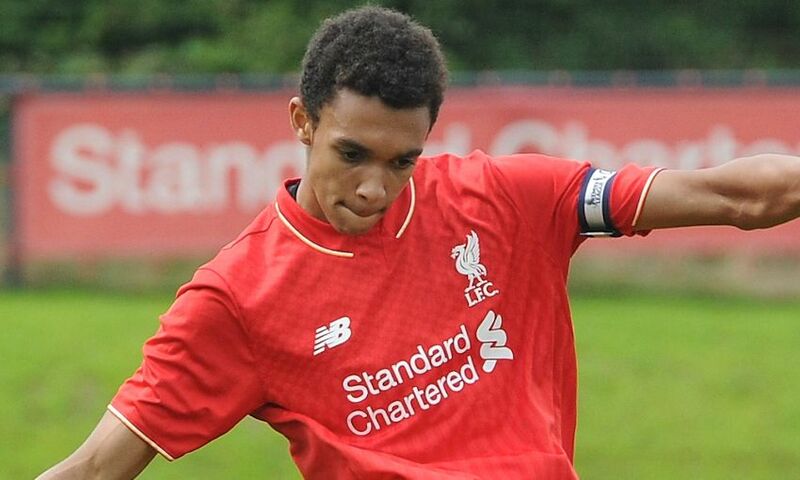 Alexander-Arnold is 19 years of age and is currently playing for his boyhood club Liverpool. He joined the reds in 2005 when academy coach Ian Barrigan had spotted him playing in this football camp. He began training two-to-three times a week and has progressed up every rank of the academy structure and later went on to captain the club at U16 and U18 level under coach Pep Lijnders. He excelled during his time with the academy and in 2015 was singled out by former Liverpool captain Steven Gerrard, who tipped him to have a bright future at the club in his autobiography. Trent first took part within the senior sqaud when they went on there pre-season tour to America in 2016. Alexander-Arnold made his first-team debut on 25 October 2016, starting in the fourth round of a 2–1 EFL Cup victory over Tottenham Hotspur. He was booked in the first half for a foul on Ben Davies before being substituted for first-choice right back Nathaniel Clyne in the 68th minute. During the same season in 2016, Trent had announced his long term plans to stay at Anfiled and he signed a new long term contract with the club. He then started in Liverpool’s next EFL Cup match later that month and registered his first assist for the club, setting up Divock Origi with a fabulous cross for the opening goal of a 2–0 win over Leeds United and he also claimed the man of the match award. 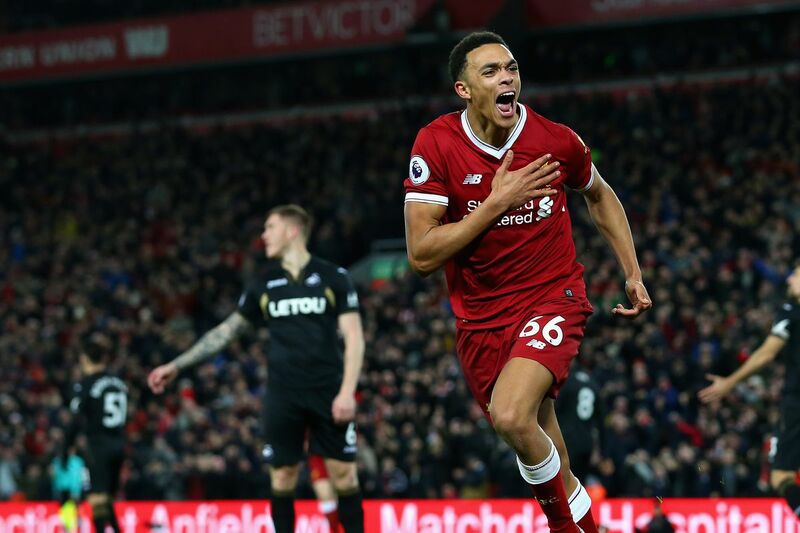 Alexander-Arnold then made his Premier League start on the 14 December, coming on as a late substitute for Origi in a 3–0 win over Middlesbrough and made his first league start in a massive derby agaisnt Manchester United on 15 January 2017. On 9 May 2017, he was named Liverpool’s Young Player of the Season and later that month was nominated for the Premier League 2 Player of the Season award. His debut season ended with him having made 12 appearances across all competitions for the club. Before the 2017–18 season, Alexander-Arnold once again commited his future to his boyhood club Liverpool signing a new long-term contract with the club. On 15 August 2017, he scored his first goal for the club on his European debut, a free kick from 25 yards out, other contenders like Mohammed Salah and Emre Can were over the ball but Trent wanted it the most. In doing so, he became the third youngest player to score on his European debut for Liverpool, behind legends like Michael Owen and David Fairclough. 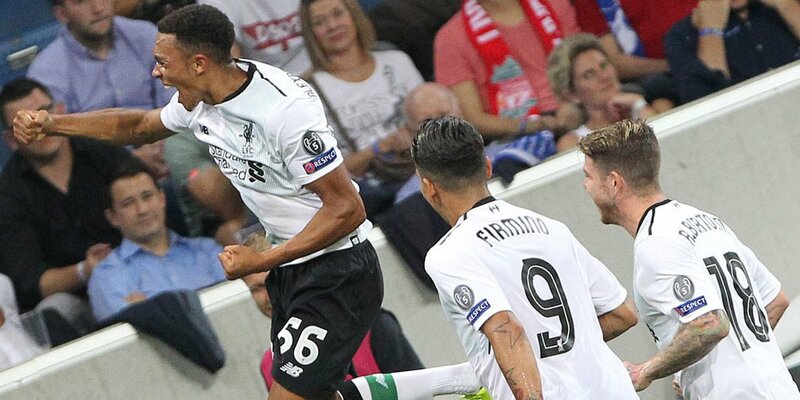 During the group stages of the competition, Alexander-Arnold scored again in a 7–0 Champions League win over Maribor on 17 October, a result which was the joint-largest ever away win in the competition, and largest away win by an English club. He then scored his first Premier League goal for Liverpool on Boxing Day, netting in a 5–0 win over Swansea City at Anfield, the celebration is one that can never ever be forgetten. On 4 April 2018, Alexander-Arnold became the youngest English player to start in a Champions League quarter-final match. He was playing one of best teams in the world at this current point and performed outstandingly well in a 3–0 win over Manchester City… not to mention he also pocketed one of the most deadly threats in the league Leroy Sane. He was named man of the match and praised for his ability to nullify City winger, Leroy Sané. He impressed again in the reverse fixture as Liverpool eliminated City 5–1 on aggregate to advance to the semi-finals of the competition for the first time in 10 years. He then started both the home and away leg of the UCL semi-finals beating Roma 7-6 on aggregate to progress to the Champions League Final. Due to this amazing season hes been having on 10 May, at Liverpool’s reward night his domestic and European form was rewarded when he won the Liverpool Young Player of the Season award for the second season running. But, Trent’s season is no where near finished not only is he in the Champions League Final playing agaisnt Real Madrid arguably the best team in the world but Gareth Southgate today name the 19 year old in the 2018 World Cup squad. Everyone at Liverpool and his family have shown much needed support and praise to the young lad posting lots of congradulations over social media and this moment is one he cerntainly deserves and will never forget.